I am a 3rd year Science student working towards a 4-year Honours degree in Physics. I grew up in Brandon and graduated from Vincent Massey in 2016. I began dancing at Steppin’ Time Dance Studio at the age of 8, where I later became an assistant and instructor. I am currently president of the Brandon University Physics and Astronomy Club, and enjoy occasionally volunteering at public observation nights at the BU observatory. I am passionate about my interest in science and motivated to share this enthusiasm with youth through the Let’s Talk Science outreach program. I am very grateful for the research opportunities I have been offered here at BU through the Physics Department and the Co-op program. I plan to pursue graduate studies and a career in physics or engineering. 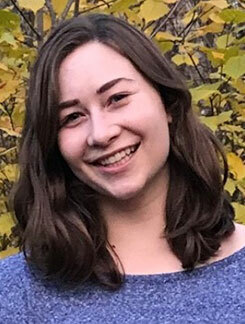 Please consider this as my nomination of our department’s student Ms. Bailey Forster for recognition during International Women’s Day 2019. Ms. Forster is a 3rd year student in a 4-year Honours major program in Physics. As told by her parents, Bailey was a “bookworm” from a very early age, and has been a budding scientist ever since she first assembled a Cassini-Huygens paper model that they downloaded from NASA. Bailey came to Brandon U. as an honour-role science and math High-School student from Vincent Massey. While taking a full 5-courses per term load at BU she maintains an astounding GPA of 4.25 overall, and a straight 4.3 in every single Physics course she has taken. There are very few students in any university able to maintain such a standard in what is traditionally a difficult and sometimes grueling program. At BU she has been involved in restarting the BU Physics and Astronomy Club (BUPAC) as their new President. She is a Let’s Talk Science member, a BU Astronomical Observatory volunteer, a TA in physics, and a pioneering student in BU’s new Co-op program. She also has worked as a Research Assistant with two BU professors in astrophysics (Foster) and (currently) in math (Dr. Nasserasr). From her summer 2018 research work, I believe Bailey would be one of the future bright stars in the field of radio astronomy and astrophysics, should she choose this as a career. While on a research trip to the National Research Council of Canada (Dominion Radio Astrophysical Observatory, near Penticton BC) in late July 2018 she made a major discovery in radio telescope survey data that she had been working with all summer, spotting that radio waves coming from clouds of neutral cool hydrogen gas high above the Milky Way were “polarized”. While polarized radio waves are nothing new, their presence in cold hydrogen clouds so far from the warm disc of our galaxy is something startling. The implication is the hydrogen gas above the Milky Way is actually partly ionized (hot), and that there must be a major (unknown) source of energy up there heating it! She is first author on a discovery paper we are preparing to submit to Nature (Astronomy). When this is published it will be an incredible achievement for a 3rd year undergraduate student. Another student might have glossed over the subtle correlation between radio polarization and emission in these clouds, and dismissed it, but not Bailey. Chance favours the prepared mind. Bailey’s interests are diverse, extending beyond math/science into the performing arts. At VM she was in band, choir, and acted in major drama productions. Her extracurricular interests include playing piano (for 9 yrs), and performing in Tap and Jazz dance as a student (now as a teacher) for 11 years. She also has performed for several years in community theatre productions (by Mecca). Her list of Scholarships and Awards is impressive, totalling eleven while at BU. In getting to know her, I discovered Bailey has a passion for advocating for girls to enter and succeed in the physical sciences. Not only does she encourage younger women to consider the physical sciences as a field of study and career option, through her own success she leads by example as a role model for girls and women in the physical sciences. Bailey’s own role models are women in the physical sciences and STEM: Natalie Panek, Canadian Aerospace Engineer; Dr Katherine J Mack, astrophysicist; and Dianna Cowern, MIT Physics graduate and science communicator. Bailey is making a tremendous contribution to our field and to society with her advocacy. I have no doubt that because of her efforts in the near future we may see a new balance with more young women declaring physics and math majors at Brandon University.